They met on an online dating site and decided to meet for a first date without much meaningless texting. Instead of any usual first dates, they decided to do something else, something fun. They ditched the classy meal at a 5 star restaurant which involved sharing pleasantries, talking about the weather and cracking jokes they read on internet which could be used as ice breakers. Instead, they decided to go for Chinese takeout, sitting and eating in his truck, eating ice cream and going for a long walk in the Central Park while discussing what brought the shine in their eyes and what made their heart skip a beat. With the right people, this would work. And since they both were very excited about it, it naturally worked. She told him how she had given up on men and being 32, this was going to be her last attempt at finding a partner. The brave woman in her told him how she would have no problem in living alone for the rest of her life. The kind woman in her told him how she did not want to have any kids. The passionate woman in her told him how she wanted to travel the world and never settle down. Instead of investing in an apartment in NYC, she wanted to invest in experiences and memories in different countries and make the world her home. And then, he told her how he could never live like her. The decent man in him told her how he needed people in his life and living alone would be worse than being unemployed or broke or homeless. One of his passions included having a family with many children. 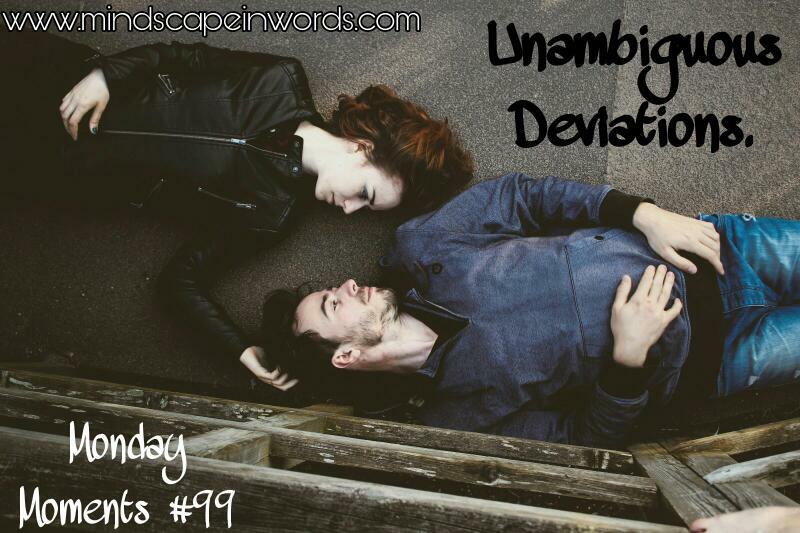 The devoted man in him told her how the thing that sparked him was stability in his life. The honest man in him told her how he would rather invest in an NYC apartment, stay in an average job in the same city around his family and focus on the little things and make one little home. 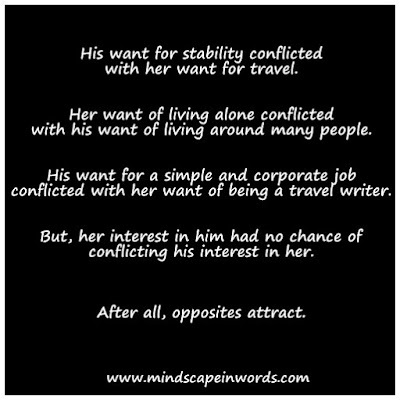 His want for stability conflicted with her want for travel. Her want of living alone conflicted with his want of living around many people. 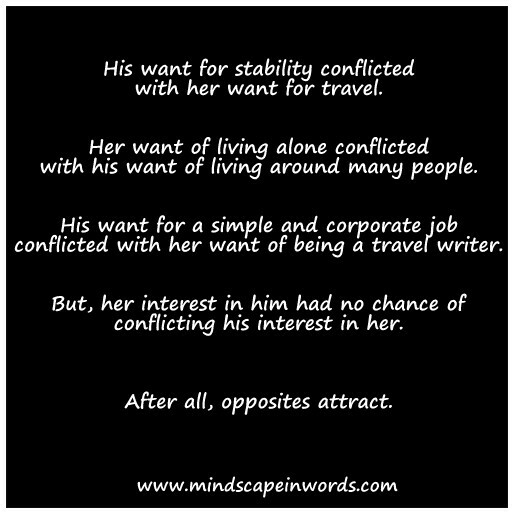 His want for a simple and corporate job conflicted with her want of being a travel writer. But, her interest in him had no chance of conflicting his interest in her. After all, opposites attract. Later in the evening, she told him the story that made her decide on her career. He could empathize. He told her the story behind why he just wanted to be a common man. She could empathize. They talked about their love for books, music and Netflix. They talked forever and yet they never ran out of things to tell each other. It wasn't awkward. It was comfortable and lovely. After their long walk in the Park, they slept under the stars and discussed their fears. She feared that if she'd be with someone, she'd lose her independence. He talked about how he feared Alzheimer's disease. But, they both feared to be in love with someone where there was no future. When it was almost morning, they understood how they had no realisation how fast time had passed. They went to grab some coffee and have some serious discussion. It wasn't even essential to say it. It was clearly out there. They could easily love each other and have the kind of life that love stories are written about. But also, it wouldn't work because it'd involve compromises and resentment which would ultimately lead to a dull life. They stepped out and headed to different directions. But then, something was missing. They looked back at the other, came closer and kissed. They held each other for what seemed like infinity. It felt like they were soul mates but they had to search their own souls first. Finally, they went their own waves with some smiles, some tears and also some hope. She decided to keep this date as a last beautiful date and remember him as a caring man who would settle down with someone and that'd be enough to make him happy. And, he decided to think of himself first and to remember her as the fierce single-by-will woman who could grab some stars and that'd be enough to make her happy. I feel like I'm dipping into the first few pages of a novel. Great writing! This is such an interesting examination of relationships and priorities! It's also such a coincidence because I just posted on my blog about how soulmates may be those people who don't ultimately stick around in our lives in the longterm, but who teach us vital lessons that we needed to learn in order to become who we needed to be. So interesting to read that same theme in this beautiful piece! I love your writing style!! You captured human thought brilliantly :). Looking forward to reading more!